Letters From My Father’s Murderer by Laurie Coombs honestly was not a book I initially wanted to read. The title isn’t something that screams “fun and exciting” yet there was something intriguing to me about this book and it drew me in. Laurie Coombs has a wonderful way of writing that is encouraging even while she is exposing of her most introspective thoughts. 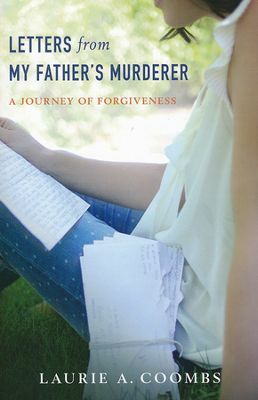 This book is about one woman’s journey to go beyond saying she forgave her enemy, to taking the actions necessary to actually follow through the forgiveness. It’s also the story of a man who found the difference between calling himself a believer and becoming a follower of Jesus. I loved her honesty when she tells of dealing with her father’s murderer and struggling to understand how she and the murderer both claimed to be Christians yet each sat on the opposite side of a prison cell. There were times in reading this book that I honestly just wanted it to be over. I wanted to be able to wrap up the story with a nice bow and call it good. But just as life isn’t that simple, neither is Ms. Coombs story through forgiveness. I believe one of the most powerful statements in the book is when Anthony (the murderer) reminds Laurie that as believers, they may stand next to one another in heaven praising God. The powerfulness of this statement shows that no matter what the sin, once a person comes to God and accepts Jesus’ as Lord and Savior, they are counted as one of the brothers/sisters in Christ. It also demonstrated the importance of remembering the real purpose for loving Jesus, and that is to bring others to him. Through Anthony and Laurie’s story, they show how forgiveness removes the numbers and labels on every prisoner and reconciles them to God. All in all, I found Letters from My Father’s Murderer to be a potent book and would absolutely recommend it. I received this book from the Book Club Network and Kregel Publishers in exchange for my honest opinion which I’ve provided here.